Running Tests : describes how to run the pytest. Writing Tests : explains how to write tests. Miscellaneous : covers additional information relating to tests. The pynq package provides tests for most python modules. To run all the tests together, pytest can be run in a Linux terminal on the board. All the tests will be automatically collected in the current directory and child directories. For a complete list of pytest options, please refer to Usage and Invocations - Pytest. During this phase, the pytest will collect all the test modules in the current directory and all of its child directories. The user will be asked whether a device is connected, and to which port it is connected. For the answer to the first question, “yes”, “YES”, “Yes”, “y”, and “Y” are acceptable; the same applies for “no” as an answer. You can also press Enter; this is equivalent to “yes”. For the following question, type “PMODA” for devices connected to PMODA interface, or “PMODB” for devices connected to PMODB interface. Answering “No” will skip the corresponding test(s) during the testing phase. Again press “Enter”, or type “yes”, “no” etc. At the end of the testing phase, a summary will be given to show users how many tests are passed / skipped / failed. This section follows the guide available on Pytest Usages and Examples. You can write a test class with assertions on inputs and outputs to allow automatic testing. The names of the test modules must start with test_ ; all the methods for tests in any test module must also begin with test_ . One reason to enforce this is to ensure the tests will be collected properly. See the Full pytest documentation for more details. Decorators can be specified directly above the methods. For example, users can specify (1) the order of this test in the entire pytest process, and (2) the condition to skip the corresponding test. More information on decorators can be found in Marking test functions with attributes - Pytest. An example will be given in the next step. """Test for writing a single value via the loop. (with a delta of 10%). Users can use a straight cable (instead of wires) to do this test. Note the assert statements specify the desired condition, and raise exceptions whenever that condition is not met. A customized exception message can be attached at the end of the assert methods, as shown in the example above. In our tests and demos, we have used a Pmod ADC. 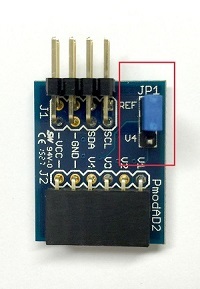 In order to make it work properly with the testing environment, you need to set a jumper JP1 to REF on the Pmod ADC. This will allow the ADC to use the correct reference voltage. Straight cable (upper one in the image): The internal wires between the two ends are straight. This cable is intended for use as an extension cable. 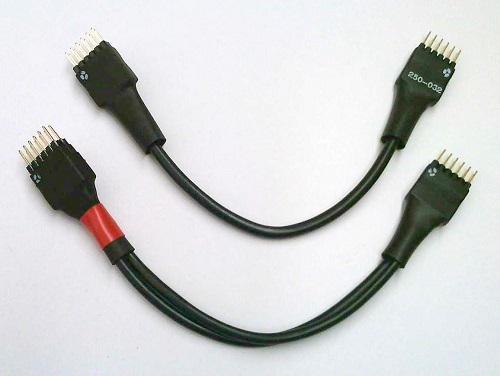 Loopback cable (lower one in the image, with red ribbon): The internal wires are twisted. This cable is intended for testing. There are marks on the connectors at each end of the cable to indicate the orientation and wiring of the cable. You must not short VCC and GND as it may damage the board. It is good practice to align the pins with the dot marks to VCC of the Pmod interfaces. For testing, there is only one connection type (mapping) allowed for each cable type. Otherwise VCC and GND could be shorted, damaging the board. © Copyright 2017, Xilinx. Revision c971535a.